Sprout has just finished a strategic dental branding project for Maple Family Dentistry, bringing 3 differently branded locations under one umbrella. Formerly known as Mackenzie Dental Health, Maple Family Dentistry had three locations – two in Maple, ON and one in Niagara Falls, ON. Each clinic was operating under a different name and had its own distinct dental branding. Two of the clinics had websites and one location did not. The websites were not mobile responsive and extremely outdated. One of the websites was not SEO friendly and did not reflect the type of information that patients require, creating confusion. The existing messaging also focused on technical procedures and did not clearly convey the value of the brand. This project included consumer and industry research which resulted in new messaging and creative. A responsive, SEO-friendly website was designed and developed to reflect the brand strategy findings. The mobile-friendly website allows each location to market regionally, while centrally servicing customers across Canada. 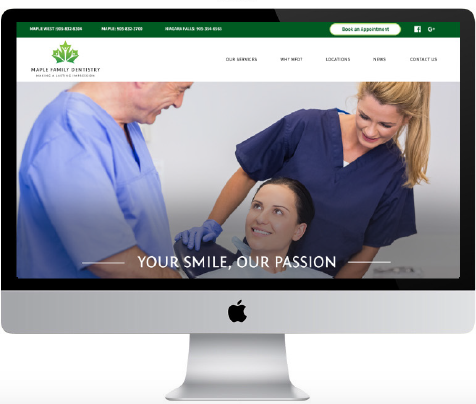 The website developed meets WCAG 2.0 accessibility guidelines and is one of the few dental websites that is fully AODA compliant (see more on accessibility websites). Currently, Maple Family Dentistry has three locations to conveniently service its patients but will soon be expanding. See the new logo, tagline and website here for the full story.